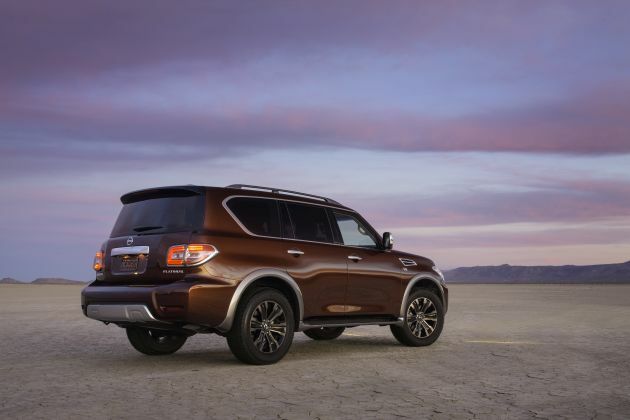 What changes will make the 2018 Nissan Armada different? Few, if any, following a radical reimagining for model-year 2017. The 2018 version of Nissan’s biggest SUV will continue as a surprisingly luxurious full-sizer that’s also capable of serious off-road duty. Attribute Armada’s rugged nature to the basic design it shares with the Nissan Patrol, a go-anywhere SUV sold in overseas markets and particularly popular in the Middle East. Armada transitioned to the Patrol platform upon its 2017 redesign, joining the QX80 from Nissan’s premium Infiniti division as the automaker’s third Patrol-based SUV. With the ’17 relaunch, Armada abandoned a platform it had shared for nearly a decade with the Nissan Titan full-size pickup. Today’s Armada is slightly more compact than its predecessor, but still seats up to eight on three rows of seats. Most notably, its styling is far more upscale than before, its driving manners more refined, and its interior décor would serve nicely in a luxury-class SUV. Expect the ’18 Armada to return in three trim levels, all with a standard V-8 engine and the choice of rear-wheel driver or four-wheel drive (4WD). Little reason to. It’ll be a virtual duplicate of the ’17 version, but likely will cost a bit more. Expect a repeat of a three-model lineup consisting of SV, SL, and Platinum grades. With base prices in the $45,000-$61,000 range, these will again be well-equipped SUVs, with such features as a navigation system and LED headlamps included on all, and amenities like leather upholstery, a power-folding third-row seat, and 20-inch alloy wheels standard on the volume-selling SL and Platinum editions. If it fits your bill, yes. Why pay more for an ’18 model that will look identical and have the same performance and features? Buying a ’17 will also get you the same sturdy, body-on-frame construction that’s proven itself in international war zones. Beneath its stylish skin, Armada is old-school. It’s among the few remaining sport-utility vehicles built like a truck, with a separate chassis, rather than like a crossover, with a car-type unified body/frame structure. Once, virtually all SUVs were body-on-frame. Today, the list is relatively short. Within Armada’s competitive set, there’s the Chevrolet Tahoe and Suburban (and their GMC Yukon and Yukon XL cousins), the Ford Expedition, and Toyota Sequoia. Most drivers don’t need the heavy-duty capabilities of a true SUV – hence the overwhelming popularity of crossovers such as Nissan’s own Pathfinder, a seven-seater that’s more space-efficient and fuel-efficient than the Armada. But Armada’s V-8 power, rear-wheel-drive-based handling, 8,500-pound towing ability, and genuine 4WD are some of the attributes run-of-the-mill crossovers cannot deliver. There may be a new color choice or two, but expect the ’18 Armada to otherwise look identical to the ’17. It’s an attractive visage, handsomely proportioned and decorated with just enough interesting details, such as front-fender vents that are in fact functional air intakes. This is a large vehicle: it’s rangier stem to stern than a Tahoe or Sequoia; Ford had not released specs on its redesigned 2018 Expedition in time for this report, but the Armada is longer than the 2017 model. Distinctions among ’18 Armada trim levels should remain minor, with wheel design and diameter – 18 inches on the SV, 20 on the others – one main differentiator. Others include chrome mirrors (heated and with puddle lamps) on SL and Platinum, and fog lamps as standard on those models and optional on SV. The cabin will remain an impressive blend of strong, upright shapes contoured into a sophisticated, upscale look. The gauges are unobstructed, the controls clearly marked and easily accessible. The infotainment screen that serves the nav system is mounted nice and high, but, at 8-inches diameter, seems a little small given the Armada’s scale. Solid materials and good insulation from road, wind, and engine noise enhance the ambience. Seating for eight is standard and all models comes with a 60/40 split/folding third-row, with power folding optional on the SV and standard on the others. In the Platinum model, the second-row bench can be optionally replaced by a pair of captain’s chairs, reducing capacity to seven (and sacrificing the flagship’s second-row seat heaters). In any configuration, there’s generous room in the first two rows. The third row, however, is extremely difficult to access and very cramped once aboard. This is a big demerit. 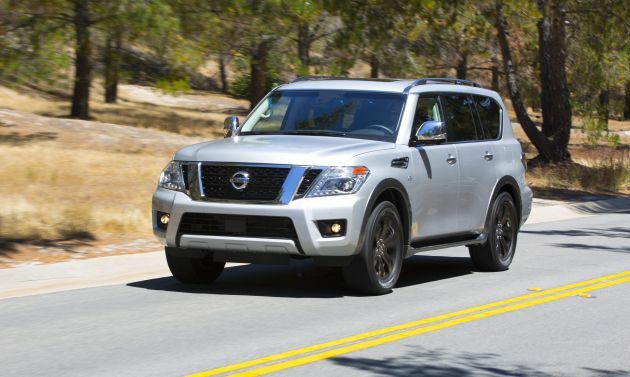 If you’re considering the Armada as a genuine seven- or eight-passenger family vehicle, check out the roomier third rows in the Expedition and Sequoia, and even in Nissan’s own Pathfinder. Cargo volume is just below average among direct competitors, through at 49.9 cubic feet behind the second row and 95.4 cubic feet aft of the front buckets, it’s still generous. A power liftgate is optional on the SV and standard on the others, although it lacks hand’s-free operation. No. The 2018 Armada will reprise the Patrol-based engineering it has in common with the QX80. It’ll also share with the Infiniti a 5.6-liter V-8, here likely to again rate 390 horsepower and 394 pound-feet of torque versus 400 and 413, respectively, in the QX80. It’ll continue to link with a seven-speed automatic transmission and a choice of rear- or four-wheel drive. Nissan calls the 4WD system All-Mode All-Wheel Drive. It provides the driver a center-console control to direct it to automatically switch from rear-drive to 4WD to maintain traction on both dry and slippery surfaces. It also includes locked-in 4WD “high” and 4WD “low” settings. The latter suits severe off-road conditions and teams with Armada’s generous 9.1-inch ground clearance for impressive all-terrain grip. Snow and tow modes also are provided. Acceleration is robust from any speed and the console-mounted transmission lever slips easily into an adjacent gate, where it can be toggled to upshift and downshift. Armada is a companionable cruiser and its all-independent suspension resists float at highway speeds and easily absorbs most bumps and ruts, even on the 20-inch tires. Alas, the steering feels light and vague. And the tall build and sheer mass contribute to noseplow if you attempt a tight corner with any verve and trigger a good degree of body lean if you take even routine turns at more than a moderate pace. To be fair, those traits are part and parcel of the body-on-frame, full-size-SUV experience. Given no changes to powertrain or aerodynamics, highly unlikely. That leaves 2018 Armada buyers facing another fact of old-school-SUV life: abysmal fuel economy. Nissan’s big rig is even worse than most, with the ’17 model rating 14/19/16 mpg city/highway/combined with rear-wheel drive and 13/18/15 with 4WD. Oddly, the heavier and more powerful QX80 rated higher, at 14/20/16 and 13/19/15 mpg, respectively. Among direct Armada competitors, only the Sequoia had lower 2017 EPA ratings: 13/17/15 mpg with rear-drive and 13/17/14 with 4WD. Even stretching the competitive set to include the Suburban leaves the Armada looking thirsty: the more massive Chevy rated 16/23/19 with rear-drive and 15/22/18 with 4WD. Not likely. Nissan seems to have Armada dialed in, with sales of this second-generation model more than doubling those of the outgoing version through the first quarter of 2017. Expect all 2018 Armada models to again include as standard heated power front seats with power lumbar, with the Platinum added cooled front seats, and, along with the SL, leather upholstery. We’re impressed that even the base SV comes with the navigation system. But you’ll again need to move to an SL or Platinum for access to the sorts of amenities typically expected in vehicles like this, and most Armada buyers do. For example, the 2018 SL should again build on the SV with such standard features as a power tilt/telescope steering column, remote engine start, the power liftgate, and Nissan’s Around View Monitor. The top-of-the-line Platinum will again include all that, plus plush leather door trim, a rear DVD entertainment system with dual 7-inch headrest displays. A power moonroof is likely to again be unavailable on the SV, optional on the SL, and standard on the Platinum. Nissan is likely to maintain the status quo with the 2018 Armada’s safety features. Among high-profile driver aids likely to remain unavailable for the SV, optional on SL, and standard on Platinum are adaptive cruise control that maintains a set distance from traffic ahead, blind-spot warning, and autonomous emergency braking that can automatically stop the Armada – in forward and reverse — to prevent a collision. 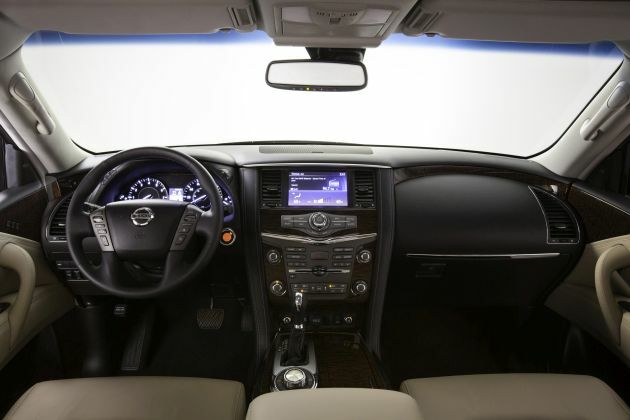 With no change in the safety-features policy for 2018, exclusive to the Platinum will again be Nissan’s Blind Spot Intervention system, which can apply counter-steering if you’re about to change lanes into the path of an unseen vehicle, as well as lane-departure warning with automatic lane-maintaining steering correction. Base prices are almost certain to increase, and given healthy demand, Nissan may feel confident with a greater-than-usual bump. Still, the 2018 Armada should remain competitively priced against direct rivals. Estimated base prices here include the manufacturer’s destination fee, which was $1,195 on the ’17 Armada. Estimated base prices for the 2018 Armada SV are $45,400 with rear-wheel drive and $48,200 with 4WD. For the ’18 SL, they’re $50,200 with rear-drive and $53,100 with 4WD. For the ’18 Armada Platinum, they’re $58,100 and $61,000, respectively. Armada’s 2018 options content and pricing is also apt to mirror that of the 2017 model. Look for the SV Driver Package ($1,120) to again contain several features standard on the SL, including fog lights, automatic-dimming rearview mirror with universal garage-door opener, the power liftgate, and the power-folding third-row seat. For the ’18 SL, the moonroof should again add $800, while the Technology Package ($1,770) furnishes the driver aids standard on the Platinum – to the exclusion of blind-spot intervention and lane-departure warning and corrective steering. On the Platinum, replacing the second-row bench with captain’s chairs should again cost $450. Expect a fall 2017 release date for the 2018 Armada.